The current to be used is an equivalent steady state current. The microwave drive power, at a frequency of 2856 MHz, is provided by a single XK5 klystron tube (the old SLAC klystron). This tube can provide up to 25 MW. The ATF modulator can provide the XK5 klystron with high voltage for about 3 microseconds. This 3 microsecond pulse is called the macropulse. The repetition rate for the macropulses is from 1 to 6 per second. Within each of these macrobunches we accelerate from 1 to about 200 electron bunches (depending on the photoinjector's laser setting). These current bunches are called micropulses. The micropulse repetition rate is up to 81 MHz. 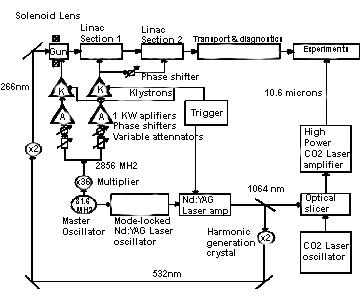 Schematic layout of the ATF linac emphasizing the laser and rf loops, timing and frequencies.